The Penguin Penguin USB UltraSlim DVD±RW Writer (TPE-USBDVDRW) features a compact size that is 20% smaller than conventional DVD writers to accommodate today's hectic mobile lifestyle. The Penguin DVD writer is compatible with all major operating systems. Note: This item is not available for shipping outside of the US. We currently only have our white variant of this model remaining in stock. 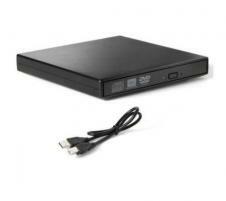 If you prefer a black DVD-RW drive please see our newer model which is available in black.